With ample growing space for smaller areas, the Ogrow Deluxe Walk-In 6 Tier 12 Shelf Portable Greenhouse is ideal for patios and yards alike. 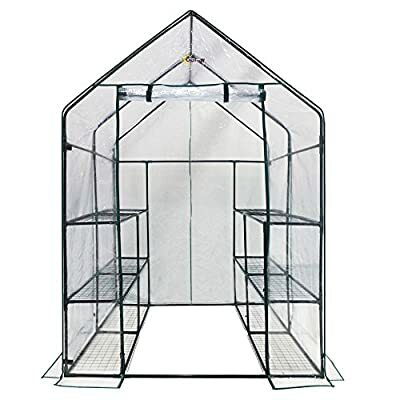 Made with heavy duty, powder-coated steel shelving which will not rust, this mini walk-in greenhouse comes with a clear cover and features a durable velcro hook and loop connections. The 12 shelves are made to hold your heavy pots, trays, and tools, while the small walk-in area provides extra growing and work space. The cover is made to roll up to allow for ventilation and moisture control and will not fade or crack in the sun. Made to give you a head start on the growing season, this beautiful greenhouse includes high quality plastic connectors for easy assembly and no hardware is needed. Additional Features Entrance measures 30W x 89H in. 12 shelves provide plenty of space Walk-in design provides plenty of growing space 16-inches between shelves 2-inches between the ground and the first shelf Plenty of room for your plants to grow Roll-up cover for easy access Allows for ventilation and moisture control Cover will not fade or crack in the sun Perfect for displaying greenery in full sun High quality plastic connectors for easy assembly Gives you a head start on the growing season Fits in almost any garden Quality materials for long-lasting durability No hardware needed for assembly Specification: Note - Ties to attach the shelves to the frame, and anchors to attach the greenhouse to the ground are not included in this purchase. Heavy duty powder-coated steel shelving. Steel shelving will not rust. Features a velcro hook and loop connection. Strong, durable, and clear cover. Shelving is made to hold your heavy plants. Measures 56L x 56W x 77H in..